HD Video produced to increase awareness of China's promise to stop that country's significant ivory trade. The brief was to use the rare footage of Forest Elephants provided by the Elephant Listening Project to create a 2-minute message communicating the importance of "China's Promise ". The video was released at the launch of the new campaign. The message was co-sponsored by numerous conservation NGOs, including The International Fund for Animal Welfare, Humane Society International and the Amboseli Trust for Elephants. Watch the 2-minute video below. HD Video providing a lively introduction to some of the amazing characteristics of elephants. Produced as a "thank you gift" for the many contributors to the fundraising campaign to support the well being of the elephant Kham La and her Herd. These elephants were rescued in 2015 by Save Elephant Foundation in Northern Thailand. Watch the 5-minute video below to find out about Fabulous Feet, Bathing Beauties and the Truth about Trunks. HD Video for the seahorse display at London Zoo. The presentation provides an introduction to the unique characteristics of seahorses. 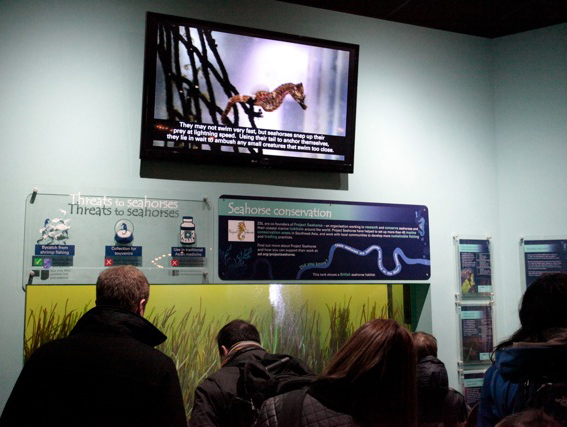 The large monitor is positioned in a didactic display that includes an opportunity to observe the work in ZSL's seahorse lab. The video intentionally has no sound, so that it can be successfully incorporated with the other exhibition elements. Pamela has also produced a film documenting amphibian disease mitigation work undertaken in Mallorca by ZSL. The film, which is on permanent display in London Zoo's Amphibian exhibit, can be viewed at the bottom of this page. View the 3-minute seahorse video below. Profile of the volunteer experience at ZSL London Zoo and Whipsnade Zoo. 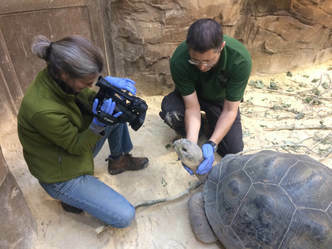 The video was used as the focus of a celebratory event honouring ZSL's volunteers, and is also used as part of a recruitment programme for new volunteers. A profile of the international conservation programmes of the Institute of Zoology, the scientific department of the Zoological Society of London. Statements from interviews with the scientists are illustrated with original footage as well as pre-existing video and still documentation of the international conservation work of the organisation. The film was produced for the Institute of Zoology, and funded by the Vodafone World of Difference Foundation. View the 15-minute profile below. Pamela was awarded a VODAFONE FOUNDATION WORLD OF DIFFERENCE placement at the London charity Spitalfields City Farm. View the 60-second commercial below to hear Pamela describe the value of applying one's professional expertise to the work of a charity. Conceptualisation and production of animal topic videos for Spitalfields City Farm's website and YouTube Channel. These videos are used as a fundraising tool to support animal sponsorship at the Farm. The production of the videos was sponsored by a Vodafone World of Difference grant. View examples of the 1-minute videos below.